This entry was written by Tomás, posted on 20 June, 2009. Filed under In video and tagged John Maeda, RISD, Sir Ken Robinson, TED. 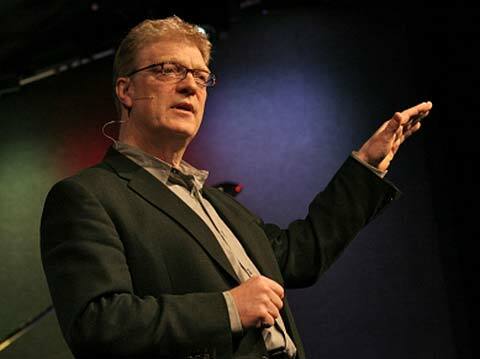 Sir Ken Robinson –the recognized British author– is one of my favorites thinkers when I consider the areas of education and creativity. Addressing an audience he is witty, clever and has a brilliant sense of (British) humor. In a clear example that the world of Design is giving him the kind of recognition he deserves, he has recently received a RISD (Rhode Island School of Design) honorary degree (note that John Maeda –another brilliant person– is the president of RISD since June 2008). According to a press release, the five people receiving an honorary Doctor of Fine Arts degree on this ceremony were ‘entrepreneur Caterina Fake, best known as the co-founder of Flickr; Apple designer Jonathan Ive, leader of the team behind the iconic iMac, iPod and iPhone; arts advocate and educator Roger Mandle, president of RISD from 1993-2008; writer and creativity expert Sir Ken Robinson, a cultural visionary who will also deliver the keynote address; and accomplished artist Betty Woodman, widely considered one of the most important ceramic artists working today’ (see ‘Sir Ken Robinson to Deliver Keynote Address at Rhode Island School of Design’s 2009’). Robinson has received much recognition years ago in England by being the Chairman of a Committee in charge of writing a report on ‘the creative and cultural development of young people through formal and informal education’, whose title was ‘All Our Futures: Creativity, Culture and Education’ (PDF, 1.3Mb ) and his latest book is ‘The Element. How finding your passion changes everything’. I might be considered a latecomer to Sir Ken’s ideas: I saw him for the first time on a talk he gave at TED’s conference about how schools kill creativity. I remember that Prof. Thomas Bley projected the video of this talk on a Faculty meeting, while I was working in the University of Otago (kudos to TED for giving global availability and strong momentum to ‘ideas that worth spreading’). After hearing his thoughts on creativity and education, I added him to the list of authors I like to follow. According to Maeda, that was present that day back in 2006 at TED, he was so impressed by Robinson’s ideas that he changed his career pathway according to that (was it probably the motivation behind for leaving his ‘confortable’ position at the MIT and taking his actual place at RISD…?). Finally, as Robinson says on his speech, life is not linear. Then why education should be…?